We thought these were kind of geeky but we certainly were wrong!! You need to nurse your baby in public...what to do??? 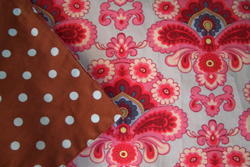 Throw on your beautiful and reversible nursing cover and go to town! Amuse Me Baby is a new line of beautiful nursing covers that fits securely over your head and around your neck. It's created especailly for nursing so you can see your baby while you nurse. The bright ribbons hold your baby's attention under the cover...they really are so smart! Mutli-functional, very chic...this product is a must-have for new mothers! Perfect for a wonderful holiday gift!